The combination of a Yin Yang symbol with the sacred symbols of the Ba Gua diffuses the impact of killing chi aiming at your house. The combination of a Yin Yang symbol with the sacred symbols of the Eight Trigrams or Ba Gua diffuses the impact of killing chi aiming at your house. 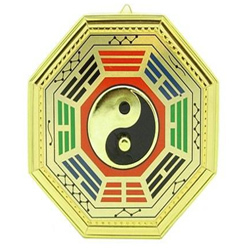 A bagua, with or without mirror, is a useful cure in Feng Shui. This octagonal tool is widely utilized for safeguarding against very dangerous energies.